This is the Four Mandala Offerings to Chittamani Tara, consisting of several rounds of the 21 Praises to Tara and other prayers. 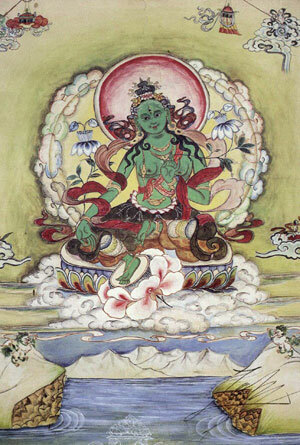 Tara (the Liberator) is a Buddha in female form who represents in particular all enlightened beings’ skillful activities. Contemplating Tara brings quick results in whatever we want and need – the ultimate happiness of enlightenment, (known as the Mother of all Buddhas, she awakens and helps fulfill our potential to attain enlightenment) ; and also helps bring temporal benefits of this life relating to work, business, family, relationships etc. Through Tara practice, you can obtain any happiness in this life that you wish. Bring offerings of flowers and fruits if you wish to. Making a donation is totally optional (see below). You can just come and help with the chanting. Or you can make a donation even if you’re not attending.